Floatron can be used successfully in ponds and water features to control pond algae. 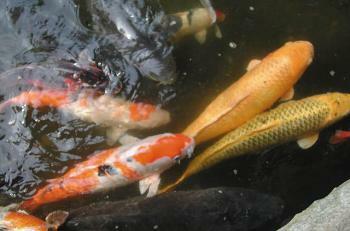 Pond algae control has proven to be a real problem for applications with fish in the water. Accordingly, use of algaecides, chemicals, etc are not desirable and will often result in a fish kill. The primary idea of the floatron is to mineralise the water – with beneficial minerals which are inhospitable to microorganisms but of no consequence to the larger plants of the fish. Aeration of some sort remains a necessity, as the fish must have oxygenated water to breathe. UV filter systems are excellent at killing the pond algae but leave the cleaned free water vulnerable to another algae attack. UV is not always efficient at killing filamentous algae (blanket weed). In the past, these nuisances had to be manually removed. This is where the floatron comes into its own. By using the floatron alongside UV systems, Blanket weed will not grow and the mineralised water from floatron will not be subject to repeated pond algae growth. The floatron comes with a special instruction manual on how to use the unit with Koi fish and how to control algae and blanket weed in large ponds where waters are captive – ie, no inflow or outflow of water. Adding copper sulphate to the water, this is too much, too fast and not a nice chemistry in ingest. Also, you add a lot of sulphur with the copper, and that’s not good either – kills everything in sight including the fish. Not too expensive to buy, unless purchasing this chemistry with a fancy name on the bottle. Aeration is good, but usually localized to a small area of the pond, leaving most of the water unaffected. Typical systems emit air bubbles from the bottom, which simply rise to the surface. Without correct water motion, not much oxygen is picked up by the water during the bubbles short trip to the top – but its better than nothing. Ultrasonic frequency broadcast within the body of water can affect and control algae growth, but one wonders what effect that frequency range has on fish ……. and the systems are not cheap. Oxygenation still needs to happen to aid the fish. Staw bales placed in the pond can help, and need changing every so often. Fairly heavy and bulky a natural approach to water maintenance, not always ‘strong enough’ for some situations. Fountains are good, as they help aerate, but the water should be additionally pumped/ moved to get the oxygen around – a tough situation. Algae blooms are not normally halted by a fountain’s activity; the resultant water movement from a fountain is just about, the pump does itself i.e. circulates from where it falls to the pump intake. The rest of the pond stays still. Changing the water out every so often, and cleaning out the water feature can work, but is labour intensive and not fun. The fish have to accommodate to the new water each time also. By doing this the algae will still come back every time. Live bacterial filters can be effective, although their forte is just that – bacteria, algae can and will still grow in the body of water. Still need oxygenation and water movement. Phosphates…. real food for algae. Gets into your water by way of rain, dust, runoff, leave, uneaten fish food, you name it. Phosphates can be removed with a good ‘phosphate remover’ (chemical); once down to trace amount, the algae will not have much to feed on. Removing phosphates in conjunction with mineralized (floatronized ) water is a good combination. UV filter systems are excellent at killing the algae, but leave the cleaned algae free water vulnerable to another algae attack. UV systems are not able to deal with blanket weed as it attached to the pool edge so cannot pass through the filter. By using floatron alongside UV systems, blanket weed will not grow and the mineralized water, will not be subject to repeated algae growth. The floatron can help in virtually all of the above situations (except #1). Koi ponds, or all ponds for that matter, need to have oxygenation, and water flowing and recirculation (the floatron will not work in bodies of water which have an inflow and outflow). In addition to these basics, the water should be mineralized just enough to control the algae growth. This is best done with the floatron. Because the floatron is a trickle charger, instant results should not be expected. As with any sizeable body of water, quick and fast changes are to be avoided; slow, deliberate and longer lasting changes will prove to be advantageous and result in higher quality over the long term. The floatron can do an outstanding job, but you must allow it time to do it. a) The body of the water must have a recirculating pump system. b) The water must be captive, i.e. no inflow or outflow of new water. c) Total capacity should be approx 25,000 imperial gallons (113,000 litres) or less. d) Sunlight must directly illuminate the solar panel. I If possible start with a cleaned out enclosure, with new water. It is better to prevent algae than to eliminate existing algae. II Float the unit in sunlight, preferable near the pump inlet or outlet. Tether as necessary. This will ensure adequate mineral ion mixing with the complete water volume. IV Use of the screen is not recommended in ponds. V When the pond algae begins to die off and turn brown, remove the floatron if the water is clear enough, the ion test kit which compares colours should be used to establish an ion level of 0.2 – 0.3ppm approx. (Koi and other fish remain healthy in ion levels up to at least 0.3ppm – do not exceed this level!) If starting with new water and without existing algae, use the test kit to determine ion level and floating time. Do not over ionize! VIi The objective is to float the unit as little as possible to achieve the desired results. Not that large bodies of water will require up to full-time floatring, while smaller systems will suffice with part-time. Environmental factors such as cloudiness, rain, temperature etc will affect floating time. If some pond algae is preferred instead of complete obliteration, float just enough to maintain the desired balance. Sometimes blanketweed and pond algae are too much of a challenge for floatron or any other system alone, therefore the best solution seems to be using a floatron alongside a UV Filter. The UV filter will kill the existing algae and the floatron will mineralise the water preventing new growth. X Phosphates can cause real problems, they get into your water by way of rain, dust, runoff, leaves, uneaten fish food, you name it. Phosphates can be removed with a good ‘phosphate remover’ (chemical); once down to trace amount, the algae will not have much to feed on. Removing phosphates in conjunction with mineralized (floatronized ) water is a good combination. IT IS ESSENTIAL THAT THE SPECIFIC POND INSTRUCTIONS ARE FOLLOWED OR THERE COULD BE A RISK TO YOUR FISH! DO NOT GO AWAY FOR A LONG PERIOD OF TIME AND LEAVE THE FLOATRON IN YOUR POND WITHOUT IT BEING MONITORED!